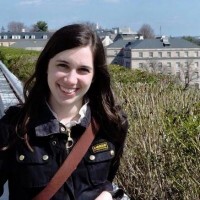 Marie O’Connor serves as the Digital Content Coordinator for the Commission on the American Museum of Women’s History . Her previous experiences include, TecBridge, a nonprofit organization based in Scranton, PA, where she developed and maintain the organization’s website. Marie has also worked for the Carnegie Museums of Art and Natural History, where she enjoyed ensuring a positive experience for guests. She recently joined the Election Board for the Ward 14-21 in Allegheny County, Pennsylvania to help execute government elections in her community. In addition to her work with the Commission, Marie currently works as a Programs Assistant at the University of Pittsburgh in the Office of Freshman Programs, where she assists both students and administrators. She graduated from the University of Pittsburgh with a BA in History in 2013. Marie currently resides in Pittsburgh, Pennsylvania.